Hi, I was testing some things on my protoboard to learn a little about transistors. The batteries are two AA 1.5V in series. The resistor is a 1Kohm. The transistor in a TIP122. I uploaded a code that just put Pin9 as OUTPUT and HIGH, so I can test the currents on the circuit. 1.Current beetwen the Pin9 and the Resistor: 1,32mA. 2.Current beetwen the Baterry(+) and the Colector: 0,43A. 3.Current beetwen the Emissor and the Ground: 0,32A. I can`t understand this currents. I was expecting 3mA ((5-2)/1000) on the 1st case and 3A (1000(gain)*3mA) on the 2nd and 3rd. Is this circuit goinbg to damage my Arduino, since there is 0,32A going to the Ground Pin? I would say so. You seem to be using the transistor to short out the batteries. The voltage is probably sagging as a result abd giving you screwy measurements. I am just testing the transistor. I thougt that by puting a resistor on the Base, I would make the transistor limit the current that flows beetwen the Colector and the Emissor. The 1K resistor should give me a 3mA current on the Base, which should give me (with a 1000x gain) 3A flowing from Colector to Emissor. You need some kind of load in between emitter and ground. Anything really. A resistor and LED would do. Without it you're running the risk of blowing up the batteries. is battery being short circuited here?since there is no load in going frm positive to negative terminal or the transistor will prevent since some amont of current will be flowing through the transistor too? Yes, it's the same as connecting a wire directly from the positive to the negative terminals. 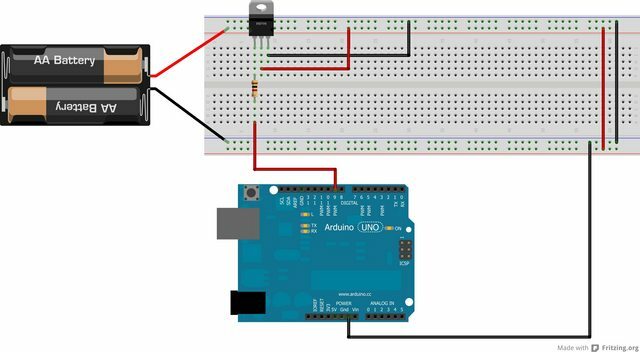 The only difference is that the wire can be added and removed electronically using a signal from the arduino. The transistor provides a little resistance, but not much. EDIT: Ok, it probably won't blow up the batteries, but they won't last long like that. AA's tend to start leaking hot battery acid when you're really hard on them like that. Or at least they did 30 years ago when I was trying to make them explode as a kid. Yes. In fact, I was doing this circuit with a LED and a Resistor before. I am not really worried about killing these batteries, the only thing that in annoying me is the currents that does not match. the only thing that in annoying me is the currents that does not match. 1) The internal impedance of the batteries is in effect putting a series resistor that limits the current. 2) You are not accounting for the fact that the data sheet gain is not one exact figure but can follow a range. An odd justification. Do you also put an electric heater in the bath just to test? Ok, I understand what you tryint to tell me. I will make another circuit and came here later. Thanks. Try to remember that measuring transistor current gain in that manner is not recommended. If you had a current source of sufficient capacity... With NO CURRENT LIMITING. To see the effects of current gain you must use a transducer of some sort, a resistor is a good beginning and a higher voltage power supply would be required as well. Where do you get 5- 2 from? Edit: sorry i guess the arduino is powered from a 5v supply. So what I said is probably wrong, except the power dissipation. the voltage across the darlington is , say, 1.4v, so 3v - 1.4 leaves 1.6mA which is close given i just guessed the emmiter-base voltage. as for the collector current, I would guess the battery was not able to supply the current. There is the third thing, say you succeed in drawing 3Amps from 3Volts, now the tip122 dissipates 3*3 =9Watts with no heatsink. Probably melt the breadboard. I good idea is to add, say,a 10 ohms resistor in the collector circuit, then you can use a voltmeter to measure the current (1V = 100mA). It also functions as current limiter and fuse.